It finally feels like the season is starting to change. The air is getting crisper, even in the bright sun. Gold, orange, and crimson are overtaking green in the landscape. Plus it’s getting dark earlier and earlier each evening. Wait. What? You’ve been looking forward to spring’s much delayed arrival, but this certainly sounds like fall. That’s because it’s autumn in the Southern Hemisphere. 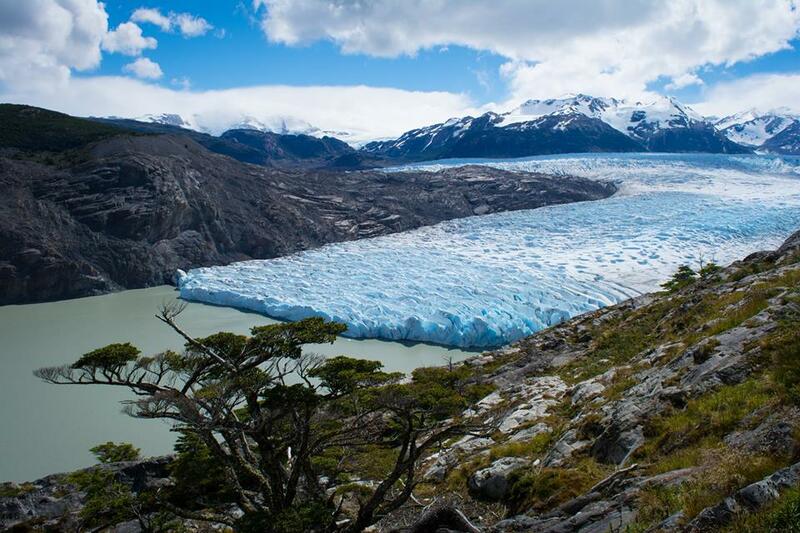 You traveled to Chile to explore Torres del Paine National Park. Though it’s one of the most visited parks in the country, it’s also one of the largest. So it will never feel crowded as you hike, mountain bike, horseback ride, or kayak around the mountains, the lakes, and the glaciers. Especially when you stay at EcoCamp Patagonia. 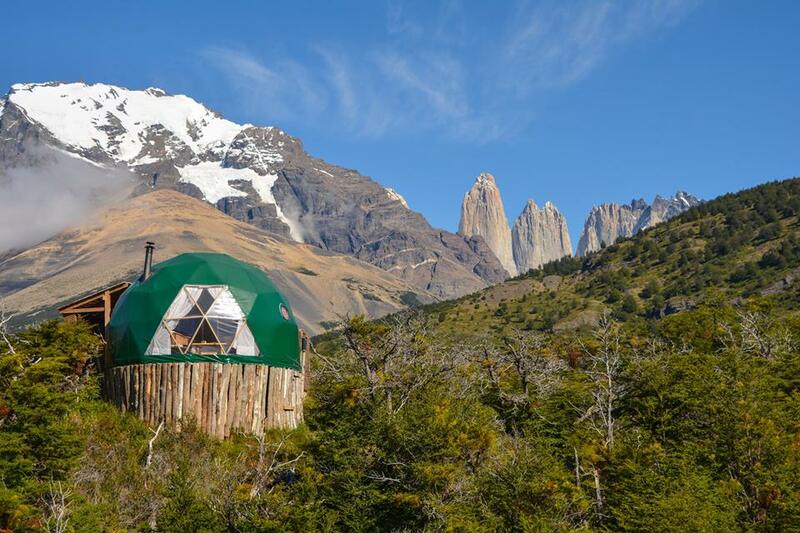 EcoCamp Patagonia is one of the most unique places to stay in the national park. It’s a camp, but it’s a really comfortable camp. Wooden walkways connect bright green domes. The Community Dome has the dining room, a bar, a library, and always-cranking wood stoves. The Yoga Dome, where you can stretch before and after your excursions, is pretty self-explanatory. While your Superior Dome features a queen-size bed, from which you can fall asleep while staring up at the snow-capped mountains and the starry sky. Even with a propane heater, a composting toilet, and limited electricity, it’s still the nicest campsite in which you’ve ever stayed. You arrived at the camp last night after a flight from Santiago and a scenic drive from Punta Arenas. En route to the national park, you stopped for lunch in Puerto Natales, explored Cueva del Milodón Natural Monument (a massive prehistoric cave), and saw your first guanacos (similar to llamas). By the time you gawked at your beautiful surroundings and settled into your dome, it was almost time for dinner. You were welcomed to the cocktail hour with pisco sours, appetizers, and plans for the next day. Over a three-course dinner—featuring a creamy roasted beetroot soup, local fish, purple potatoes, and wine from the Aconcagua Valley—you excitedly talked to other guests who had just returned from their daily adventures. Then you listened to the wind whistle as more and more stars appeared in the sky. You don’t remember what time you finally fell asleep. It wasn’t hard to wake up this morning, though. The bright sunshine meant that it was time for you to finally start your own adventure. First, you eat a hearty breakfast and create your own lunch box from a huge spread. Then you pack to head out. Today you’re mountain biking to Laguna Azul. You’ll pedal through the plains and around puma prints. You’ll see more guanacos and handus (huge, ostrich-like birds). And you’ll find the Paine Waterfall, a small canyon, and a panoramic view that includes the lagoon with the Torres in the distance. Tomorrow is all about the Grey Glacier. You’ll ride a boat across glacial Grey Lake, change into a neoprene suit and a waterproof jacket, kayak between giant floating icebergs, and stare at the many shades of blue that make up the Southern Patagonian Ice Field. Horseback riding across the prairie and hiking to the Towers, three gigantic granite monoliths sheared by glacial ice, will follow after that. While coffee and cookies are always waiting for you back on the terrace when you finish your day. With views like this, you can certainly wait for spring a little bit longer.